Salento caves preserve an extraordinary inventory of fossil remains. Starting from the Adriatic side, in Roca Vecchia, there is immediately the Poesia (Poetry) Grotto, a natural paradise that preserves some important archaeological witnesses. The legend tells that in this Grotto, from its salutary waters, a wonderful princess loved to bathe and with her beauty she draws many poets from all over the South of Italy. Going on towards South, the next Grotto is the Neolithic Cervi (Deer) Grotto, in Porto Badisco, one of the most imposing monuments of pictorial and rocky art of Europe. It has more than 3.000 pictographs in ochre and bats guano that represent dancing and hunting scenes, geometric figures and shamans. In Castro there is Romanelli Grotto with graffiti that show a mythology founded on sexual symbolism. Remains of elephants, rhinoceros, deer and penguins were discovered. Zinzulusa Grotto, so called for the numberless stalactites and stalagmites conformations that recall hanged rags shapes, can be reached from a ravine and from the sea. Azzurra Grotto is not far from Zinzulusa and can be reached only from the sea. 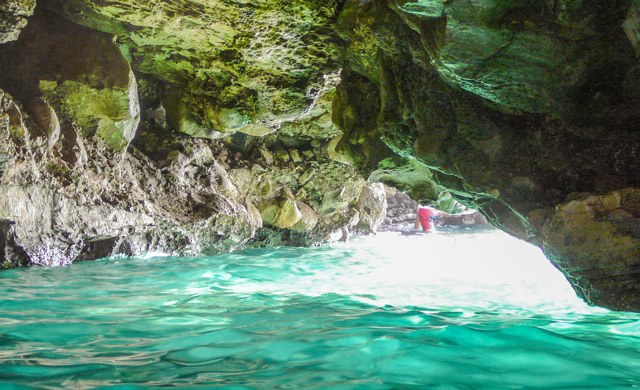 The Grotto has a variable luminescence from green to cobalt, thanks to the light refraction phenomenon. Further south, in Capo di Leuca, there are antelucan caves. Tre Porte Grotto, so called because it has three arches at sight on the sea, preserves remains of the Neanderthal man and of African fauna. Then there are Elefante (Elephant) Grotto and Giganti (Giants) Grotto where bones and teeth of pachyderms were discovered. Diavolo (Devil) Grotto has a mouth of four meters, stands on Punta Ristola and can be reached either from the sea or from the land. Pieces of utensils and Neolithic ceramics were discovered there. Presepe (Creche) Grotto is on the ionic side of Leuca, it is opened with two mouths divided by a wall and it is important for the discovery of a rare species of water sponge in course of extinction. On the Ionic side, from Punta Ristola to Uluzzo Bay, at the borders of Portoselvaggio Park Cavallo (Horse) Grotto and Uluzzo Grotto open with deposits of Palaeolithic hand made articles and remains of big mammals. The sea uniqueness, its charm and its greatness make even more characteristic these very ancient rocks protrusions. Some want acquire new information to brush up their communication skills, so they can get by easily in a foreign country while others consider learning a second language as an additional asset that would look good on their resume.